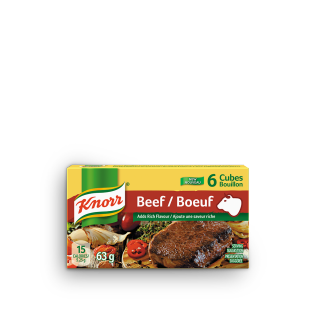 Knorr Bouillon Beef Cubes add a bold new taste to your next meal with the rich flavours of beef stock, onions, parsley and spices. Salt, monosodium glutamate, hydrolyzed soy/corn/wheat gluten protein, hydrogenated cottonseed oil, beef fat, dehydrated vegetables (onions, carrots, parsley), beef extract, water, guar gum, colour, autolyzed yeast extract, disodium guanylate, disodium inosinate, spices, tartaric acid, citric acid, hydrogenated soybean oil and sulphites. May contain traces of milk ingredients.